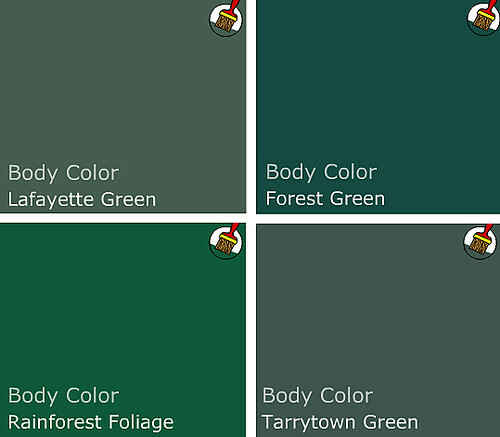 Personally, I have found that green can be a difficult color to work with, because it requires a sense of confidence that many more soothing shades do not. But when done right, green really sings. And I love the idea of using green and blue (blue in Kristin's bathroom) as a base for a household palette, since blue and green can mix and match in so many interesting ways. You'll need a pair to go all out kelly green on four walls, floor to ceiling. But this spare little bedroom courtesy of The Sweet Line gets it right with simple furnishings and accents. 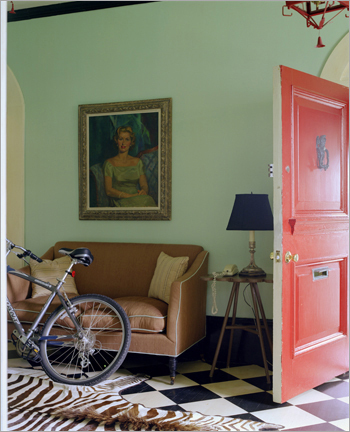 In a small room with strong color, paint is the star and everything else plays a supporting role. I'm thinking that Kelly Wearstler may have kicked off the kelly green movement in a moment of vanity (hello, kelly - kelly? ), but love her or hate her, the lady is not afraid of color. 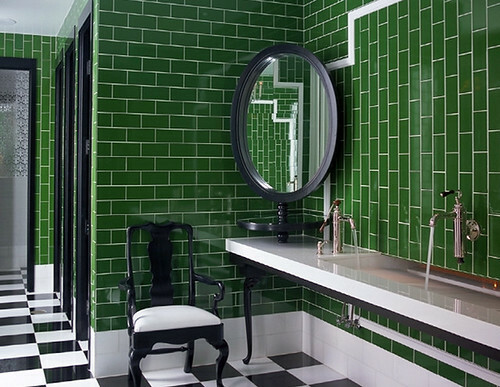 This bathroom shows how slick classic green (looks like Rainforest Foliage to me), black, white and chrome can be. 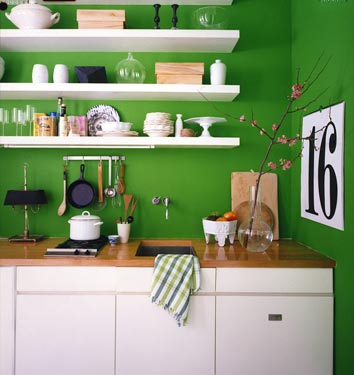 This tiny kelly green kitchen from Domino can cook. 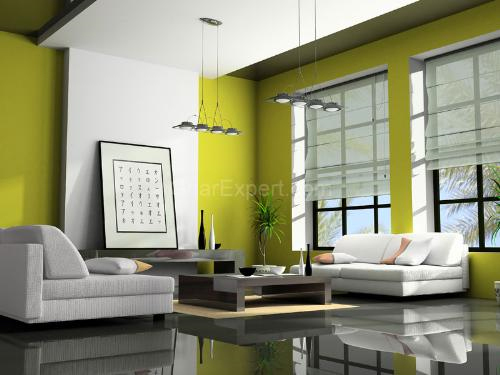 A very restricted palette with lots of white keeps the color from overwhelming. 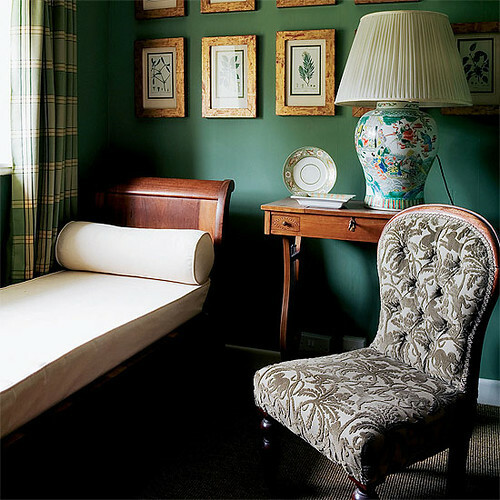 In this room from House to Home, forest green goes a little too country for my taste, but with more streamlined shapes, the color could be fresh. Imagine Danish teak instead of these tradtional furnishings. Throw in lots of white linens and a black pillow or two and you've got modern classic. If all out green seems too heavy for you, you can break the color up in several ways. 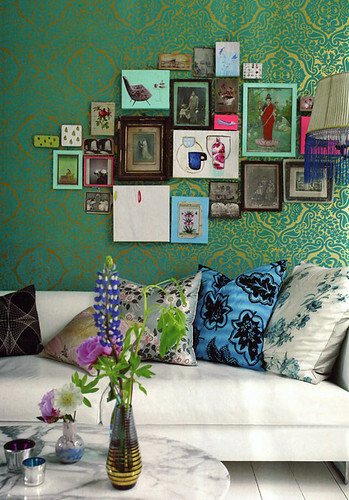 Patterned kelly green and gold wallpaper keeps the color light. If wallpaper isn't an option (renters, I'm talking to you), try stretching fabric over a a wooden frame, or wallpaper a large piece of masonite and frame with cheap, painted quarter round. Beep beep, beep beep, yeah. 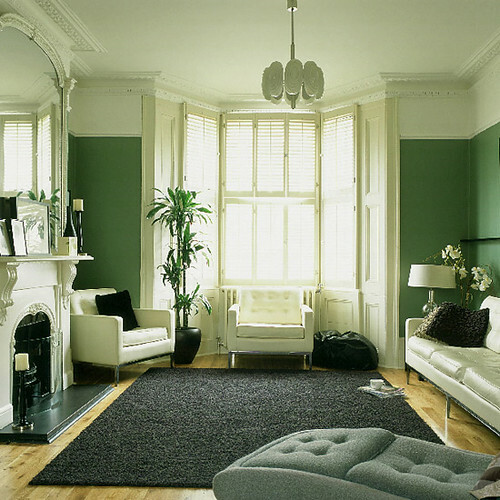 Homes with lots of molding and windows can handle the color because it covers less surface area. With deep greens, black, white and brown rocks. 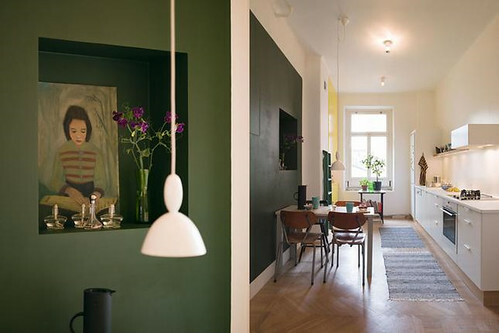 If you don't have glorious architecture and the bones to prove it, consider painting a feature wall in deep green; keep the rest of the room bright and light. Maybe kelly green isn't for you, but Stokes Forest Green is looking mighty fine. Pair it with lots of neutrals and blood orange for a pop of unexpected color. Lighter colors need less white to balance them out. 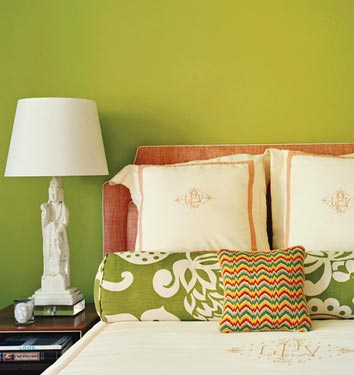 Brave souls may spring for chartreuse, like this Benjamin Moore Pear Green featured in Domino. Boring picture, but the color is divine. And Designer's Brew shows how blue and chartreuse make magic. For a bedroom, maybe just a feature wall or nook would do. Fear of commitment? No problem -- we all get cold feet sometimes. 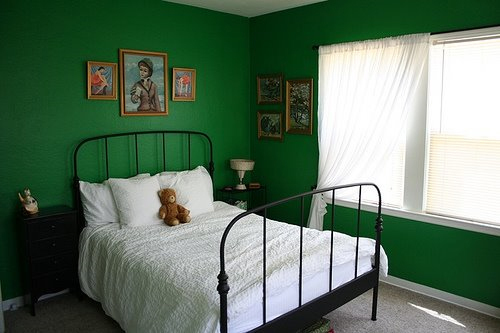 Consider green accents or furnishings instead. 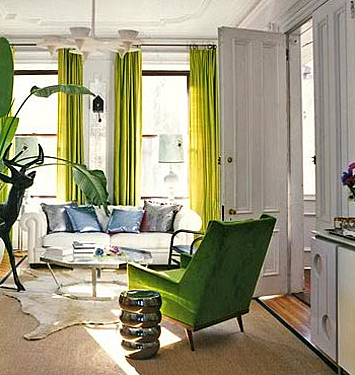 Fawn Galli's boho-glam apartment uses bright green curtains and upholstery to funk up her space. 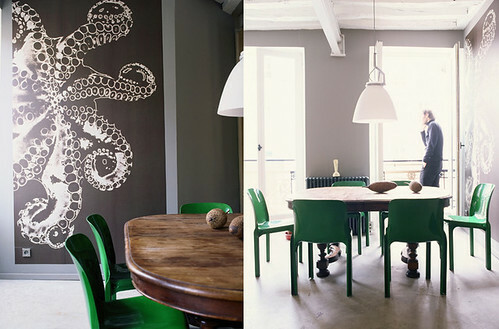 Use that kelly green paint to spiff up a set of chairs in an otherwise neutral room. 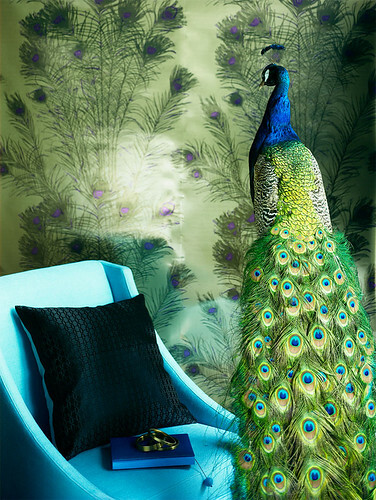 The wall paint in the photo looks a lot like my office paint -- Silver Fox by BM. 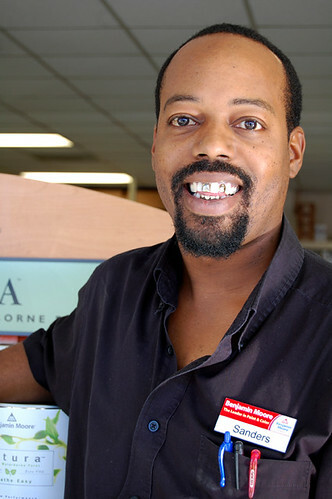 It's a lovely, medium deep neutral. Even a simple emerald throw adds depth to this dark and cozy bedroom. Or maybe instead of feeling green at the gills by all this color, you're green with envy. If you're feeling emboldened by the power of green, don't hold back. 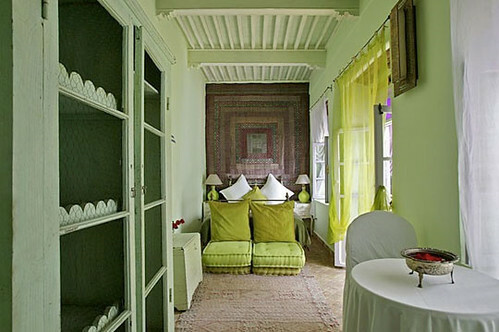 Try mixing and matching several shades in one room, like this Moroccan guest house. Lots of white space helps forest green, stokes forest green, and a pear green, go together like peas and... peas. If you would like to have your home featured on Ask Sanders, need help matching colors you may have spied in magazines, or just want advice on what paint colors could possibly make those peach wall tiles in your bathroom look like you MEANT to do that, email us at hollaback@design-crisis.com to ask Sanders, our resident Paint Guru, for help.